Appadvice Thumpies truly does reinvent the rhythm based game, and stands above Tap Tap Revenge, Rock Band, Riddim Ribbon, and all others in the category.Every single song is a joy to play. Technobrains Thumpies delivers some intense fun that will keep you coming back again and again. Touchreviews Game looks great with the just a position of the monsters and the butterflies being pulled off perfectly to create a musical game that will be loved by young and old a like. AppSpy Thumpies is a fresh breath of air in the rhythm genre, that should appeal to all ages.The game is in a league of is own. Slidetoplay Even if you're unsettled by the creepy art direction, Thumpies offers a great gameplay formula and original soundtrack that will keep you wanting to stay in this musical world. Don't miss it! Touchgen Thumpies is a great game, full of peaceful and yet cool music. There are plenty of unlockable thumpies, and each level’s tune is unique. Touchmyapps With gorgeous, vibrant artwork and a bizarre soundtrack, Thumpies is one twisted rhythm game that is definitely worth a slot on your iDevice. iFanzine Big Blue Bubble juggle addictive gameplay, toe-tapping tunes and sumptuous visuals with amazing results! 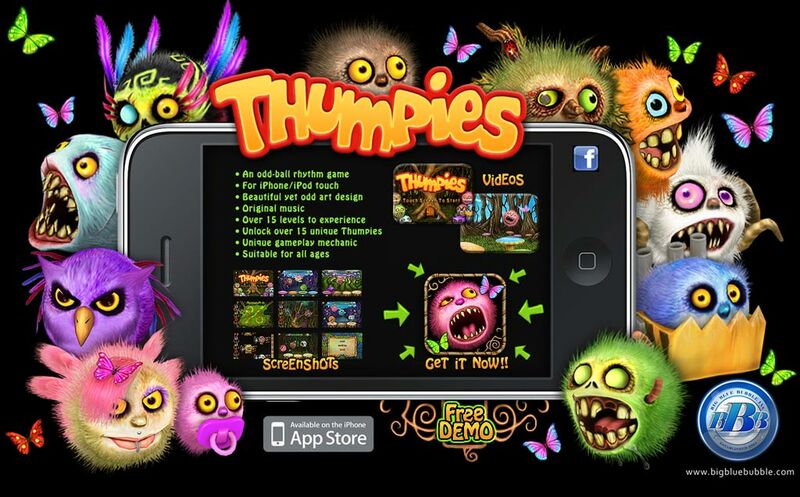 Thumpies is funky fun for all the family. Gamesuncovered We’d say that it was one of the best rhythm games out there right now for the platform, and that if you like the genre you should definitely get this one!